Happy New Years friends! 2014 holds so many promises, one of which I am making to myself. We will be taking on a healthier lifestyle at home. While we do not eat poorly by US standards, we do have too many cheat nights during the week and I have a cheeseburger problem. There, I said it...the truth is out. I cannot say no to a burger. Anyways, that is not while we are here today - this is about eating healthier in the New Year. Eating Healthy does not mean you have to lose flavor. Using the right oils in place of butter, flavoring correctly and staying away from heavy sauces means you can still enjoy a normally unhealthy meal. When I am on a health kick, I pretty much live off of boneless skinless chicken. In fact, Gabe has put me on chicken restriction a few times. I was recently introduced to NatureRaised Farms Chicken, an all-natural chicken with no hormones, no steroid and no antibiotics. These chickens are fed 100% vegetarian diets and are minimally processed with no artificial ingredients. While home for the Holiday's, my Mom and I headed to the Sams Club in Daytona Beach to pick up a package of NatureRaised Farms boneless skinless chicken breasts. As far as I can remember, one of my favorite things was shopping at Sam's club with my parents. As a kid, I would stroll down the candy aisle wishing for someone to buy me a case of Snickers. I haven't been down that aisle in 10+ years, that has been replaced with the high end wine aisle. 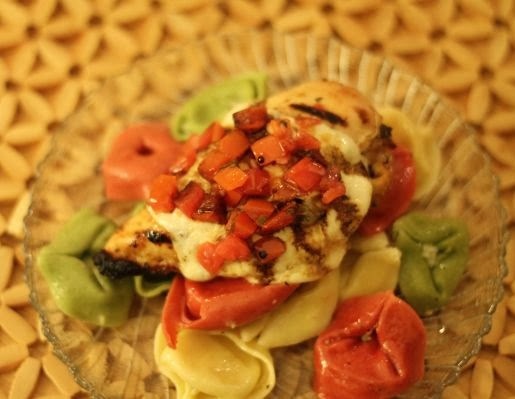 We decided to make bruschetta chicken over tortellini. 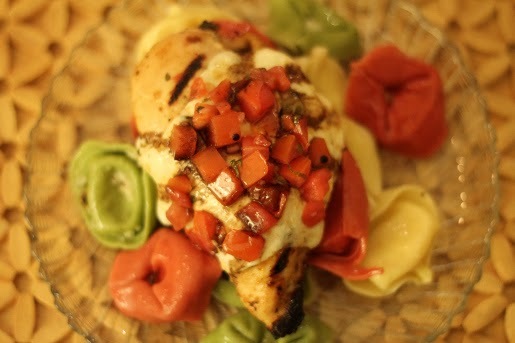 Instead of a heavy sauce, we made our own sauce with garlic and extra virgin olive oil. I marinated the chicken breast in low sodium Italian dressing (I made my own, it's easy) with a splash sriracha and low sodium soy sauce. 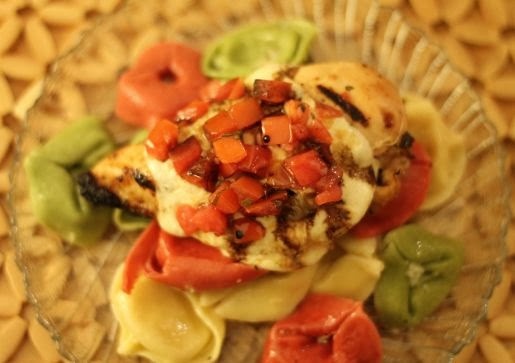 After grilling for 10 minutes on medium-high, I flipped over and placed the chicken on a piece of aluminum foil so I could top the grilled side of the breast with a piece of low fat mozzarella cheese and diced tomatoes. Closed the grill and 10 minutes later, we had dinner. It's even better if you drizzle with a balsamic reduction. Marinate the chicken in the Italian dressing, sriracha and soy sauce mixture for a minimum of 30 minutes. Grill the chicken for 10 minutes on one side, flip and lay on top of a piece of aluminum foil. top with the cheese and diced tomatoes. Close the grill and cook for an additional 10 minutes. 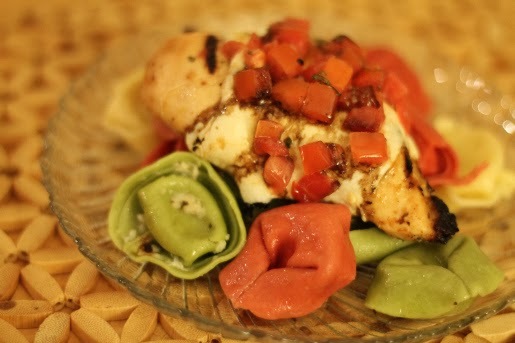 Meanwhile, cook your tortellini and make your olive oil and garlic sauce along with the balsamic glaze. This meal is simple and delicious. A true crowd pleaser and healthy. If you are near a Sams club on 1/4, NatureRaised will be showcasing their product with a food demo! What are your New Years eating resolutions? This looks delish. I love a tortellini-based recipe.